"You are a guardian of women in their most vulnerable moment. The gratitude I feel for you is infinite. Thank you for empowering me to have a wonderful birth experience." Guaranteed Backup- We take backup very seriously. We are the only doulas in the area who not only guarantee an experienced doula as backup, we take it even a step further. We work in teams of two to assure that you get to know BOTH of your doulas. Your birth is an incredibly special moment and we want you to feel confident that you will have built a relationship with whoever will be supporting you through it. Two Prenatal Meetings- During these meetings we will get to know one another to foster a strong connection and understanding of what you would like out of your birth experience. We will explore coping and comfort measures, birthing positions and develop both a birth and a postpartum plan. We will also speak about any worries, fears or concerns and discover ways to release them. If at all possible, both your doulas will attend these meetings. One Care Provider Visit- We also offer the option of accompaning you to one of your prenatal visits with your care provider. This facilitates a relationship prior to birth and builds a team of support. Many people chose to use this option in the event that your birth needs to take a more medicalized route with induction or cesarean. Unlimited Email, Call and Text Support- From date of hire and 24/7 on-call support starting two weeks prior to your estimated due date, we are available to you through email, call and text support. If your birth happens outside of the two week on-call time frame, we will make every effort to be there with you, every step of the way. Continuous Birth Support- We will support you when you need us. We feel that if you have hired us for support that we will be there when requested! We will meet you either at home or the hospital and will stay with you through-out your labor. We remain with you immediately after to help support you in bonding and breastfeeding. We will respect any wishes you have for this bonding period. 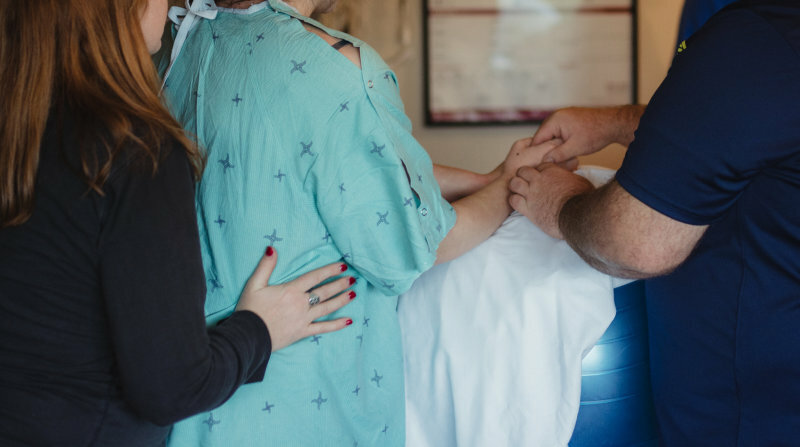 In the event of a prolonged labor, we have the option of switching doulas on your team so you are guaranteed to always have someone available who has fresh ideas and fresh energy! One Postpartum Meeting- We will visit you, usually within the first week, after birth. We will checkin with how you are feeling in both mood and healing, how breastfeeding is going and infant care. We will also go over any questions you may have and supply you with any additional resources or referrals you may need. Resources and Referral Service- We have an extensive list of valuable resources and worksheets. We will discover and share any resources and referrals you may need to the best of our ability. Birth Review and Continuing Support- At any point, when you are ready, we are available to re-visit your birth story with you. We are also always happy to hear updates, answer additional questions and be an ear if you need one at any point in your parenting journey. Ready To Set Up A No Pressure Consultation? "She came over and helped me with everything, she created a safe and caring environment for me and my family in the days and weeks after my daughter was born. I would have to say I don't know where I'd be today without her help. You can't put a price on the peace of mind and friendship she gave me. I can only hope that more women get to experience her wonderful spirit within and after their own births." Postpartum - 4-8 hour shifts, depending on your needs, of postpartum assistance. Postpartum support is intended to help with the adjustment of a new baby. We offer nonjudgemental family help and an additional set of hands so you can focus on healing, bonding and integrating your family. Support- Some things offered are help with breastfeeding, reading baby’s cues, diapering care, meal preparation, light housework, help with older children, errands, resources and referrals, companionship, care for baby so the parent can shower, eat or nap, baby-wearing assistance, soothing baby and education on soothing techniques, education on infant and parent care, caring for the birthing person while they heal and processing the birth experience. Requirements- Postpartum Support requires an 8 hour minimum commitment, with at least 2 hours worked per shift. 60 minute meeting in which we will envision your ideal birth and discuss your options, choices and approaches. We will go over formats to articulate them and tips for communicating with your care providers. Birth Preferences Checklist, Packing List and Postpartum Support Plan are included. If you chose to hire us for birth doula support, this fee will go towards your birth doula fee. We offer Gift Certificates so services can be purchased by loved ones for people who are expecting. This is a wonderful option for those looking for a baby shower gift or for individuals that may not be able to afford services on their own. Proudly supporting people and their families with Childbirth Education and Birth Doula Support for natural birth, medicated birth, epidural birth, high risk, cesarean birth, vbac, homebirth or hospital birth. Postpartum support including Placenta Encapsulation Services, breastfeeding, bottle feeding and newborn care.